Hot on the heels of The Icy Bleakness of Things, Theologian’s collaboration with The Vomit Arsonist, Cloister Recordings presents Reconcile. Timed to coincide with the upcoming live appearance at the DARKNESS DESCENDS festival, this 60-minute cassette (and digital) release contains brand-new material featuring input from Andy Grant (The Vomit Arsonist), Mike McClatchey (Lament Cityscape), Stephen Petrus (Murderous Vision), and Derek Rush (Dream Into Dust). The album was mixed by Mike McClatchey. The word “supergroup” has been jokingly bandied about in reference to this collection of artists, but the final product is indeed a unique composite of industrial sounds, reflecting another step in the evolution of Theologian. Perhaps most notable is a return to an earlier, less harsh and distorted iteration of the project, with cavernous drones and thunderous percussion creating the sort of dense sonic environments found on the 2010 debut album, The Further I Get From Your Star, The Less Light I Feel On My Face. Eschewing the longform drone/ambient tracks of older releases, here we find Theologian attempting to approximate the immediacy and memorability of pop, using rhythm and melody to elicit slightly less sprawling emotional landscapes. The album’s eight tracks are interconnected by brief interludes, serving as touchstones along the journey to the album’s denouement. As the title suggests, Reconcile is ultimately about coming to terms with past versions of oneself, while examining the present and fretting over the future. 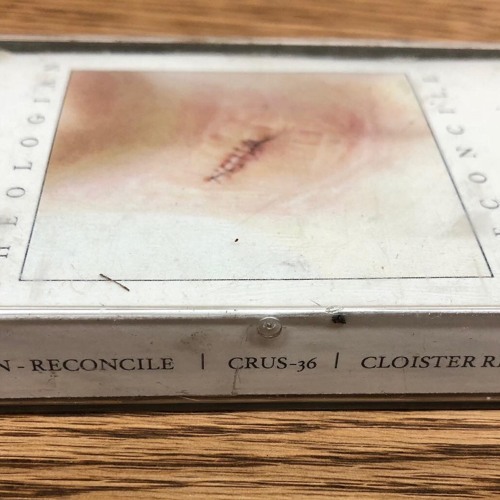 Cloister Recordings is issuing this cassette in an edition of 100 copies, which will become available for the first time when Theologian headlines the DARKNESS DESCENDS festival on Saturday, June 16 at Pat’s in the Flat’s in Cleveland, Ohio. Also performing are The Vomit Arsonist, Steel Hook Prostheses, Gnawed, Compactor, Shock Frontier, Vitriol Gauge, Cunting Daughters, and Murderous Vision. The Theologian performance will include Andy Grant, Stephen Petrus, and Derek Rush as live collaborators. The event is sold out. Soft Tissue, the 2016 collaborative release by Lament Cityscape and Theologian, will be reissued later this year, featuring completely new mixes of the original album and remixes by Achromaticist, Compactor, Cutworm, Kidaudra, Neurospora, Orphx, Over Hold, rRhexis, and Snowbeasts. Murderous Vision and Lament Cityscape have both recently completed new albums yet to be released, while The Vomit Arsonist produced a new cassette, entitled Further, in April of this year via Gutter Bloat. While Derek Rush has mostly been busy as SysAdmin for heavy electronics project Compactor, a 20th anniversary vinyl reissue of the Dream Into Dust album The World We Have Lost is in the works for April 2019.